I'd been thinking of reviewing this book for some time now, but never got around to re-reading it. Now, my appetite whetted both by reading Gaata Rahe Mera Dil, and reader Neeraj's comment, I decided to take the plunge. After all, I was only four years late with the review. Many years later, when I'd finished my graduation and was working in Madras, I listened to Jaane jaa doondhta phir yaha on the radio, and was completely enthralled. Of course, I had watched the film earlier, but I'd found it (unintentionally) hilarious that Randhir Kapoor was a college boy and that Jaya Bhaduri was walking around with a creepy doll; I hadn't paid much notice to the songs. And while I'd also watched Teesri Manzil and Amar Prem (and countless other movies scored by RD), I'd had no idea that its songs were composed by RD. In those days, which little kid paid attention to the music director? So, this was my real 'introduction' to RD as a music director of whom I wanted to hear more - and more. It helped that when I got married, my husband lived and breathed music. Slowly, as I opened the door to the exploration of RD's music, I was amazed by the wide range, and complete mastery of disparate genres that the man had perfected, sometimes - happily, crazily, inventively - mixing multiple genres to give us a new sound. And I began to understand why people swore by him, why he evoked so much hysteria (and so much controversy). It is clear, if you put a search for RD, that he is still relevant - I don't know any other music director who has so polarised a nation - people either love him, or hate him, both with equal intensity. It is also quite clear that he has played his part in the Indian popular music industry, specifically the Hindi film music industry. Two generations of Indians have listened to his melodies; a third is just re-discovering him and resurrecting his fame. Today, he's acquired cult status. As the title explains, Bhattacharjee's and Vittal's book is not a biography. The authors themselves admit that they did not set out to write one. RD Burman, The Man, The Music (HarperCollins Publishers India, Rs399), is neither a monograph, nor a hagiography that elevates its subject to the status of a demi-god. It is serious research, bolstered by interviews with the many people who were relevant to the rise and fall (and rise) of Pancham. To Bhattacharjee and Vittal, what fascinated them about RD was his music. This book, then, is about RD's music, and because one cannot separate the man from his music, about the man as well. But always in the context of his music. Beginning with a foreword by Javed Akhtar, and an introduction by none other than Shammi Kapoor, 'R.D. Burman The Man, The Music' is obviously a work of passion. It begins with a listing of the musicians who played regularly for him. They were his 'team'. Then, the book segues into the prologue - it's the year 1994. Pancham is no more. From the recollection of the musicians' collective grief as they accompanied his mortal remains to the crematorium to the anecdote of how they assembled in a close friend's flat for the shraddh ceremony, only to eat, grieve, sing and reminisce, the prologue sets a nostalgic mood. Then, it swings back to the beginning - to Chhote Nawab, Pancham's first film as an independent composer. Divided into three parts, R.D. 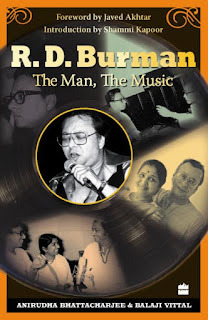 Burman The Man, The Music lovingly recreates the life and music of Pancham, as RD was lovingly called, using several of his songs as the background. Each song, selected carefully to highlight the maverick composer's range and versatility, is picked apart lovingly, set in context within the film, its melody, the inspiration for the same, the raga (or ragas) on which is based, the instruments used, the instrumentalists chosen to play the melody - if you want a thorough analysis of how a piece of music is composed, what a song goes through before it reaches our ears in 3-6 minute 'pieces', well, all you have to do is to read this book. There is an objective narration of his rocky marriage with Rita Patel, and his subsequent relationship with Asha Bhosle, the emotional distress of his last few years when Asha distanced herself from him, the insecurity of knowing that he was considered a has-been - he was unceremoniously dropped by Subhash Ghai, who went back to Laxmikant-Pyarelal for Ram-Lakhan (it hurt RD deeply when the same friends for whom he had worked before, told Ghai that if he signed RD, they wouldn't work with Ghai again), a fan's unshaken faith in him, his unexpected resurgence with 1942 A Love Story, etc. We learn little-known facts about the man and his music - did you know, for instance, that the tune that eventually became Sar jo tera chakraye tune in Pyaasa was composed by him? Or that he played the harmonica for all the songs of Dosti, composed by his friends, Laxmikant-Pyarelal? That he introduced the Latin rhythms of Bossa Nova in his first official film, Chhote Nawab? There are other interesting stories - stories of how he brought in new 'sounds' into his music: of how pedestal fans were used to create an echo in Karvatein badalte rahe (Aap Ki Kasam), and how asbestos sheets, vigorously shaken, provided the sound of thunder in Bheegi bheegi raaton mein (Ajnabee). How RD and his assistants blowing into half-filled beer bottles produced the sound that you hear at the beginning of the iconic Mehbooba mehbooba (Sholay). How he heard someone trying to start a car with a dead battery, and demanded that they reproduce the sound; he didn't care how. We read about the invention of 'the Pancham beat' - he 'invented' that sound when, hearing a maid servant rub a newspaper on the floor with her feet to get rid of a stain on the floor, he recreated that sound in the studio by inserting a tin foil between the belt of the khol and the instrument. The authors cover more than 500 plus songs, some iconic, some not so well-known. They write lovingly of what makes a quintessential 'RD' song, of how western melodies 'inspired' RD, who then proceeded to make them his own, of how he composed Musafir hoon yaaron backwards - starting with the refrain Mujhe chalke jaana hain and then working his way back to the mukhra. Bhattacharjee and Vittal do not shy away from discussing how Pancham distanced himself from his old comrades, his disproportionate (according to his associates) patronage of Sapan Chakraborty, or how he made some very basic, very strategic mistakes in furthering (or not) his career. Basing their book on a few published interviews of Pancham, and interviews with many people who knew him, and/or worked with him, Bhattacharjee and Vittal manage to write a relatively objective book about a man who is very clearly their idol. What I find interesting - and curious - is that there is no interview with Asha Bhosle, or with Gulzar, two very important people, one would argue, in RD Burman's life and career. This is especially strange, considering there is precious little credible documentation 'on record' about the film industry as a whole, a fact that the authors lament. Accompanying these anecdotes are the stories that circulate in and around the Bombay film industry. Did you know, for instance, that Sunil Dutt's role in Padosan was first offered to RD? Or that the first choice for Amitabh Bachchan's role in Bombay to Goa was Rajiv Gandhi?! (The source is not mentioned, but I would like to offer a posthumous thanks to our late Prime Minister.) Or that Mansoor Khan, the son of Nasir Hussain and director of Qayamat Se Qayamat Tak, played the young Rajesh Khanna in Baharon ke Sapne? Full of such trivia and factoids about the state of music, both Hindi and Western, at the time, Bhattacharjee and Vittal end by discussing Pancham's legacy in an epilogue - how his music has inspired musicians a generation since and continues to do so, how his compositions have withstood the test of time, and how, despite the controversies still stirred up in this age of two-minute discussions, his music still endures, standing testimony to an age, and the voice of a generation: R.D Burman The Man, The Music is a perfect addition to anyone's collection of books on cinema. Unlike my peeve with their second book, R.D. Burman The Man The Music has 'technical' analyses that even a layman can better comprehend (especially with regard to the songs discussed), and it is better integrated into the life and work of the man they are writing about. The authors have also provided a general index and a song index, which makes it easy to look up a specific song, or reference to a certain person. A collection of rare photographs of Pancham adds to the book's visual appeal. As Shammi Kapoor mentions in his introduction to the book - His [RD's] achievements need to be documented. His story needs to be told. Well, Bhattacharjee and Vittal have succeeded beyond their wildest dreams in chronicling the journey of a man who was not only a great music director, but a great musician and by all accounts, a good man and a kind one.